Sometimes tickets are not equally created. One ticket may need more focus than another. A customer may be given a higher priority by the service desk to help raise customer satisfaction in a pinch or to ensure that a long-running request receives special attention. Keeping track of these higher priority requests is important, as well as handling them quickly. OTRS provides a traffic light system based per default five levels of priorities to handle this task. The colors are based on the ID (very low being ID 1) in the database. Changing the names should be done with this in mind. New priorities have the color gray. Use this screen to add priorities to the system. A fresh OTRS installation contains five default priority levels. The priority management screen is available in the Priorities module of the Ticket Settings group. 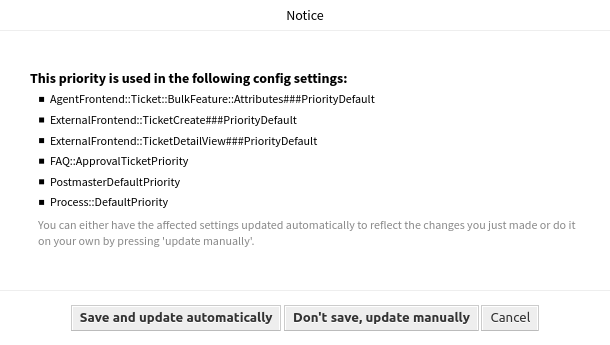 When creating a customized list of priorities, please keep in mind that they are sorted alphabetically in the priority selection box in the user interface. Click on the Add Priority button in the left sidebar. Priorities can not be deleted from the system. They can only be deactivated by setting the Validity option to invalid or invalid-temporarily. It’s recommended to limit your system to 5 priorities or less and reuse the current 5 to keep the use of the traffic light system. Click on a priority in the list of priorities. If several priorities are added to the system, use the filter box to find a particular priority by just typing the name to filter.